Ensuring access to an affordable college education is critical to North Carolina’s overall economy and the well-being of families and individuals across the state. Yet, while enrollment in the state’s four-year public universities – which collectively comprise the UNC System – has increased over the past decade, the cost of a college education also has increased for students and families. The result is that access to an affordable post-secondary education is increasingly moving out of reach for many North Carolina students and families. Since 2008, total enrollment (full-time equivalent) in the UNC System has increased by more than 18,000 students. 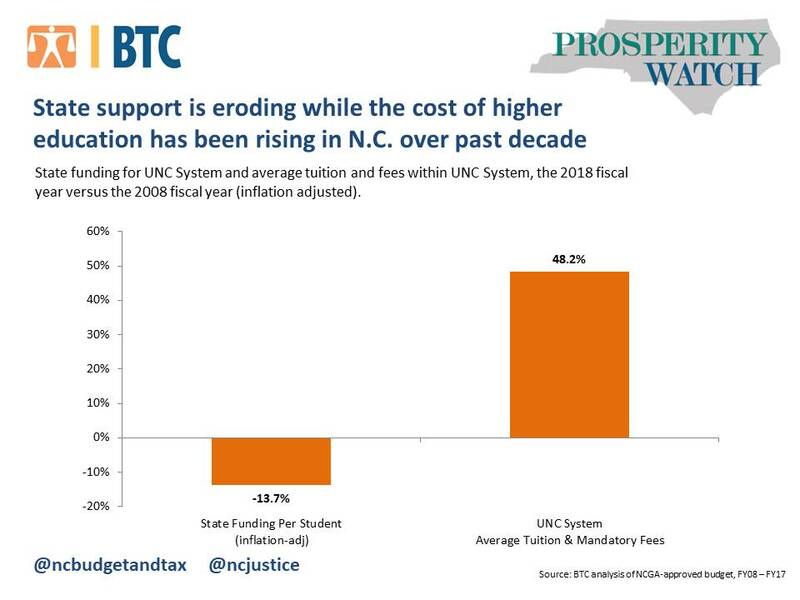 During this time period, state funding per student decreased by 14 percent, while average tuition and mandatory fees within the UNC System increased by nearly 50 percent when adjusted for inflation. Amid these diverging funding trends, public universities have been charged with serving more students, state support has eroded and the cost of a college education has steadily shifted to students and families. As a post-secondary education has become less affordable due to significant state funding cuts to the UNC System, students and families have taken on increasing amounts of student debt in order to pursue a college education. State funding cuts, consisting of management flexibility and efficiency reductions to the UNC System, total $813 million since 2008. Management flexibility cuts give respective campuses within the UNC System discretion in how state funding cuts are imposed and are in addition to other targeted funding cuts that have been made to the UNC System since 2008. Under the new state budget passed by state lawmakers, need-based financial aid – provided via lottery receipt dollars – remains at its 2012 funding level. Furthermore, the new budget provides no additional state funding beyond enrollment growth for student support services or programmatic needs to promote college completion. To achieve stated goals such as increasing enrollment and graduation rates for low-income and rural students to more closely match the demographics of North Carolina, ensuring that the state’s public four-year universities have adequate resources is important. Increased state support will help ensure that an affordable college education is available to North Carolina students and families and that student support services to help meet access and completion goals are available. This will require reversing the trend of eroding state support for higher education that has occurred over the past decade.